Online it’s all about contextual advertising — figuring out what the viewer is interested in, then showing them ads they’ll hopefully like. It frequently doesn’t work of course; Facebook knows everything about virtually everybody, but still manages to show me adverts for things I have no interest in. In the offline world, contextual advertising is tricky. Doesn’t stop them having a go. I thought it was pretty funny. And they’ve obviously designed it for that specific spot, in that specific station, because someone at the advertising agency has noticed — the electronic sign on the other side doesn’t work. Bullseye. This one though… was a bit off-target. Just a bit. I guess some guy sitting in an office in North Sydney wasn’t to know the difference between a bus stop and a tram stop. Bullseye perhaps. 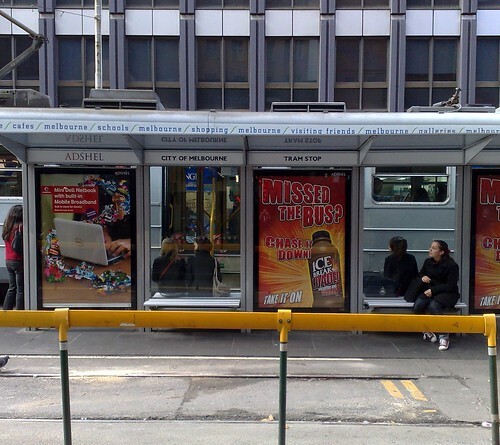 I was impressed by the photos of the Flinders Street Station ads that I saw on the iiNet website (linked from Whirlpool Forums) too. However, the “electronic sign” on the other side is a Boselli (Flipper) destination board, which admittedly does use some electronics to control the mechanical flipping of the destinations, times, platform numbers etc, though it’d be slightly more accurate to describe it as a mechanical sign. As a former employee, I have to say that working at iiNet was fun, particularly on Talk like a Pirate Day. Management listened to you. It’s not at all unheard of for employees to drink beer, vodka or go bowling, or all of the above, with the managing director and a few others from management. In 2005 their MD also took two Whirlpudlians, namely myself (then an employee) and Vaughan (then a shareholder who happened to work at Consumer Affairs), out for Borscht. The funny side of public transport’s failings did make it into the conversation that night too. 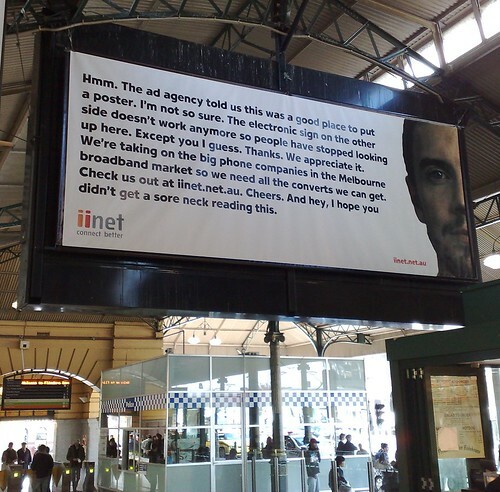 Gotta love iiNet’s advertising guys. I’d love to work for them. Now that is an advertisement I like. I don’t see many that I do like, honestly. I glaze over all the FB stuff. No attention to it at all. Really, advertising is a mugger’s game. Hit and miss, can’t really say it’s going to work or isn’t. i do like ads with brains however. Oh, speaking of well known ones, the Microsoft “geek”, the Apple “Cool dude” advertisement would be nice to have the Linux guy in there “nerdy type”. With an organic cotton shirt on would be good too LOL.